UHF reader for RFID gates in combination with wall or ground antennas. The integrated Linux CPU baord allows local programming without external computer. 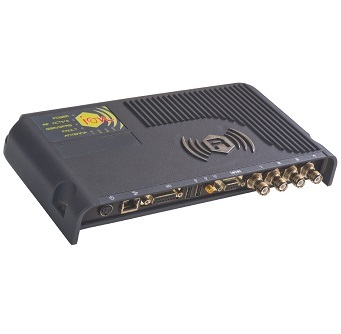 Read range of 2 - 10 m. Communication via USB 2.0, standard RJ45 Ethernet, GPRS or WLAN possible. Ideal for fixed or mobile installations such as Loading of vehicle transporters, Gates, sporting events (marathon, etc). The AGX RadioForce 1600 is the top-of-the-range portal reader. It has carefully designed the device taking into account customer requests and on-field experience on RFID installations. The result is not only an UHF reader, it's a unique combination of outstanding RFID reading performances, computing power and communication capabilities. The reader is optimized for portal installations, featuring full power to up to 4 antennas, GEN2 Dense Reader Mode management and high speed read rates. Based on an embedded HW architecture (x86) and standard operating system (Linux), the AGX RadioForce 1600 eases the development of custom software and solutions. The on-board computing power and connectivity remove the need for an external PC and related cabling. This results in deployment and operations cost savings, thus reducing the total cost of ownership of installed devices. The AGX RadioForce 1600 is best suited for complex AutoID scenarios, where the information can be collected and fed directly to the reader from multiple sources such as Smart Card readers, Barcode readers, GPS and other in-field sensors. All data can be handled locally through data buffering, filtering and aggregation, in order to directly provide decision-making data to higher level Business Intelligence processes. The same data can also trigger local actuators and screen displays for in-field real-time processes in a standalone mode. The presence on board of an optional integrated GPRS modem, together with its compact and versatile form factor, allow to use it in any worldwide installation requiring RFID usage in remote areas. As a result of all the above, the AGX RadioForce 1600 allows solution providers to customize the reader to each application, thus creating their own specialized devices accordingly. The AGX ION complies with and can operate in different regulatory environments (Europe, US, Australia, China, Korea, Japan, Singapore, Taiwan).